A review of GSE Risk Transfer structures and a new approach for transferring residential mortgage risk from GSEs to private investors – How to do Senior-Subordinate structure for Residential Mortgages without disrupting the TBA market. Note: A version of this article was also published on Seeking Alpha. The role of Government Sponsored Enterprises (GSEs) in US housing finance is bigger now than it was in 2008, when the FHFA placed Fannie Mae and Freddie Mac under conservatorship during the great crisis caused by decline in U.S. house prices, as the chart below shows. Almost everyone agrees that the housing finance system needs to attract more private capital to protect taxpayers from being on the hook for most of the credit risk being taken in the mortgage market. However, private-label securities market for residential mortgages has not fully revived due to several reasons. Freddie Mac’s K-Deal program has shown a successful method of attracting significant amount of private capital to mortgage market for the multifamily sector. It uses a normal cash senior-subordinate securitization structure but with a unique twist – the K deals issue both guaranteed and unguaranteed bonds. Freddie Mac provides guarantee on the senior bonds only. The program has been very successful in fully transferring the first loss risk of generally over 10% of the loans to private investors. An ideal structure for the single-family mortgages will be something similar. However, one factor of critical importance in the residential mortgage finance system is the need to preserve the TBA market, which is crucial to smooth functioning of the current housing finance system. TBAs and Pass-Through mortgage pools are fully guaranteed by one of the GSEs, which makes them highly liquid instruments attracting capital to the housing finance system. The GSE guarantee is what makes the residential TBA market work. Without the government guarantee, the TBA markets will not exist. These pools are often securitized by banks in Agency CMO (Collateralized Mortgage Obligation) deals, where all the bonds carry the guarantee provided by GSEs on the underlying pools. However, the need for fully guaranteed pools to allow TBA trading precludes K-deal type securitizations with a mix of guaranteed and non-guaranteed bonds for the single-family mortgages. When the GSEs issue fully guaranteed single-family MBS, they retain all of the risk associated with losses if the underlying mortgage loans default. Wanting to reduce the credit risk they hold, and encouraged to do so by the FHFA, their regulator, the GSEs have come up with new types of transactions to transfer some of the credit risk of the mortgage loans to private investors. These Credit Risk Transfer (CRT) deals have been very successful with GSEs having completed over $27 Billion of issuance since their introduction in 2013. However, these structures are derivatives and have characteristics that result in only partial transfer of risk and restrict participation from investors like REITs which limits their growth potential and market size. This article provides an overview of the CRT deal structures, and suggests a way to allow a K-Deal type structure with a mix of guaranteed and non-guaranteed bonds, without disrupting the TBA market. What are GSE Credit Risk Transfer Transactions? Freddie Mac did the first risk sharing transaction, named Structured Agency Credit Risk (STACR), in July 2013, which was followed by Fannie Mae’s risk-sharing deal, named Connecticut Avenue Securities (CAS), in October, 2013. Both of these programs transfer some of the mortgage default risk from GSEs to private investors without impacting the TBA or Agency CMO markets in any way. Mortgages are funded and traded as usual using TBA, Pool, and Agency CMO structures. The risk sharing is achieved by doing new separate transactions (STACR and CAS) which transfer the risk of default to private investors synthetically by selling a new type of mortgage bonds whose payments are linked to performance of a reference pool of mortgages. The new bonds work just like synthetic CDOs. Investors buy the bonds by paying cash. As loans in the reference pool are paid, the principal balance of the securities is paid back, and if there are losses in the underlying reference pool in future, the principal balance on their bonds is reduced without making any principal payments. Thus they bear the losses as specified by the structure of the CRT deal. Cash flows of CRT deals are entirely separate from those of the mortgages in the reference pool (which may have been sold as agency MBS securities – securitized as CMOs or as Pass-Through Pools) and mortgage payments are not used to pay holders of CRT debt. The CRT bonds are not backed by the mortgages in the reference pool and are unguaranteed and unsecured obligations of the GSEs. The coupons on CRT bonds are theoretically paid out of the G-Fee that the GSEs receive for providing the guarantee on the reference pool. Just like in Synthetic CDOs, the new securities allocate the risk of default to different tranches and losses are applied to the capital structure reverse sequentially upon certain credit events. The GSEs typically hold the safest tranche (class A-H) and the riskiest tranche (class B-H). Investors can buy those in the middle (classes M-1, M-2, and M-3) based on their risk and return appetites. The STACR and CAS are generally similar in most respects though there are some differences in detail. For example, both use a pro-rata payment structure between the senior (A-H) and junior portions of the pool, and sequentially within the junior tranches. Both the Fannie and Freddie deals contain trigger language that dictate the allocation of unscheduled principal to the classes of the deal. Both the Fannie and the Freddie deals have a Hard Enhancement Trigger, e.g. part of unscheduled principal payments is only diverted to the M-1 and M-2 if the enhancement level on the senior is above 3%, which will lock out both STACR and CAS in higher loss scenarios. However, the Freddie deals also contain a Cumulative Loss Trigger, which if tripped, will stop diversion of principal to the M-1 and M-2 classes. These transactions have been successful. As of March 2016, Fannie Mae has completed 10 CAS transactions issuing $12.9 Billion notes covering 2.5% of the $513.6 Billion reference pool, which represents 18.3% of its total outstanding single family guarantees, while Freddie has done 19 STACR transactions issuing $14.2 Billion notes covering 3.0% of $468.2 Billion reference pool, which represents 27.54% of its outstanding single family guarantees. Hedge funds and money managers have made up the bulk of the earliest investors, with REITS, banks and insurance companies participating to a lesser extent. Also, the deal structures have been evolving since their introduction in 2013. For example, while the early deals focused primarily on loans with very low loan-to-value (LTV) ratios, recently deals have also included mortgages with LTVs over 80%. These deals do not remove all the risk from GSEs. Generally, the GSEs have retained the first loss risk, although some recent deals have sold part of the first-loss risk also. This may be partly for economic reasons (first loss risk is expensive to transfer), and may be indicative of need for slightly higher g-fee that may be needed to sell a significant amount of this risk in this form to a limited set of investors. These deals may not be removing the right risks. Not transferring the first loss risk and covering losses above the first loss may not be adding value. Using credit loss rate of 0.51% on 2000-2003 Fannie loans as a guide for 2014-2015 loans (similar credit quality with LTV and FICO of 73% and 714 for 2000-2003 FN loans vs 76% and 746 for 2014-2015 FN loans), suggests there is more value in transferring the first loss risk. Retaining some risk signals alignment of interest with CRT investors, but transferring less risk also does the same. There is a basis risk that remains since the risk is not always tied to actual mortgage losses. For example, though some of the recent deals are based on the actual losses on the reference pool, the majority of deals were based on an assumed fixed loss severity. Also, some deals do not transfer specific risks, e.g. the Eminent Domain risk. The GSEs share the risk with STACR or CAS for a period of 10 years, after which the risk reverts to the GSEs. Theoretically, the risk could be sold again in a new CRT deal after the previous one matures. However, if the performance of mortgages deteriorates, the cost of new CRT deal may become prohibitive. The shorter maturity exposes GSEs to tail risk since the underlying mortgages have a maturity of 30 years. The risk sharing transactions create an obligation to pay premiums for the next 10 years and responsibility for hedging and taking the remaining risk back after the 10 year maturity of the CRT notes. These entrench the GSEs in the housing system even more, moving further away from the goal of reducing their role in the housing finance system. Both STACR and CAS bonds are uncapped 1-month LIBOR floaters with a 10-year final maturity. They are both senior unsecured general obligations of the respective GSE. Both deals are priced to a 10 CPR assumption. However, actual prepayment rate on mortgages can vary depending on interest rate movements. This introduces the risks related to negative convexity and hedging costs. Also, if the prepayments are slower than assumed due to interest rates going up, the risk will remain with GSEs for a longer period. CRTs are derivatives. They are not good assets for REITs. This restricts the ability of permanent capital from REITS to participate. So, there is a very limited and highly specialized investor base comprising primarily of hedge funds. This limits the volume of these transactions that can be done, and causes pricing to worsen as volume increases. CRT deals do not promote securitization by private issuers, and do not promote competition in the private market. Given the limitation on the volume of CRTs the market can absorb, GSEs have employed other structures to transfer some of the credit risk. Another, less frequently used approach is Credit Risk insurance deals. Credit insurance risk sharing deals shift credit risk on a pool of loans to an insurance provider which may then transfer that risk to one or more reinsurers. Both companies have turned to separate insurance deals to satisfy some of their risk-sharing requirements. As of March 2016, through 16 ACIS transactions (Agency Credit Insurance Structure) since the program began in 2013, Freddie Mac has placed approximately $4.3 billion in insurance coverage. As of March 2016, Fannie Mae has acquired nearly $1.7 billion of insurance coverage on over $66 billion of loans, provided by nine Credit Insurance Risk Transfer (CIRT) transactions since the program’s inception in 2014. In CIRT 2016-1 and CIRT 2016-2, which became effective February 1, 2016, Fannie Mae retains risk for the first 50 basis points of loss on the reference pool and an insurer covers the next 250 basis points of loss on the pool. How do Multifamily K deals work? The K Deal program is a securitization program in which Freddie Mac securitizes multifamily mortgages and creates bonds backed by the cash flows of those mortgages which are sold to private investors. K-Deal securities utilize a senior/subordinate bond structure with a mix of guaranteed and unguaranteed bonds. The unguaranteed bonds account for the overwhelming majority of the risk and are sold to private capital investors who assume the first-loss position in the event a loan goes into default or foreclosure. Freddie provides a guarantee for the senior-most bonds (which generally receive a AAA rating based solely on the quality of the underlying collateral, and not based on the Freddie Mac guarantee), but the riskier junior and first-loss bonds (generally totaling about 20% for fixed rate and 10% for floating rate deals) are purchased by private investors who take complete risk on those bonds. K-deal bonds are REMICs (not derivatives) and are good REIT assets. They are liquid and have a broad base of investors. By transferring the risk of the bottom of the stack to private investors, K deals reduce taxpayer risk. The guarantee on senior bonds acts as catastrophic insurance and would be called on only in the most extreme cases where losses exceed the unguaranteed amounts of the securities. STACR, CAS, ACIS, and CIRT are ways to lay off the risk that the GSEs already have, i.e. the risk transfer happens on the back end after they’ve purchased the loan and put it into securitization. Another approach that has been proposed is sharing the risk on the front-end, i.e. when the GSEs initially assume the risk of the loans. In a front-end transaction, a private mortgage insurer (MI) or lender takes some credit risk prior to the sale of the loan to the GSEs, with the GSEs lowering their guarantee fees to reflect the commensurate reduction in credit risk they assume when purchasing the loan. A May 2013 concept paper Up-Front Risk Sharing: Ensuring Private Capital Delivers for Consumers released by the MBA urged the FHFA to require the GSEs to offer Upfront Risk-Sharing as an options to lenders at the “point of sale,” in addition to laying off the risk at the back-end after loans have been delivered to the GSEs. The paper suggested that FHFA could require the GSEs to accept loans with deeper levels of private credit enhancement in exchange for reductions in guarantee fees and other loan level charges. In the 2016 Scorecard, one of the directives for the agencies is to work with the FHFA to conduct an analysis and assessment of front-end credit risk transfer transactions. A Fannie Mae publication provides an example of such a front-end risk-sharing transaction described as Lender-facing Risk Transfer Transactions or L Street Securities. The loan seller establishes Special Purpose Entities (SPE) to deliver a pool of mortgages to Fannie Mae. This pool of mortgages is then used as a reference pool for the lender collateralized recourse arrangement. The SPE issues securities where the performance of the securities is based on the reference pool. These securities are typically retained by the lender so that they can hold the credit risk on their loans in certificated form. Guaranty Fee on underlying loans are reduced, subsequently retained by the SPE issuer (retained IO strip), and is used to pay interest to class M securities (see figure above). The proceeds from sale of the securities are used to fund a Cash Collateral Account. The collateral account mitigates counterparty exposure and is used to reimburse Fannie Mae for any losses incurred, and then to make the principal and interest payments due on the securities.In this structure, the credit risk is transferred at the time of delivery and typically covers initial/first loss through some projected loss level. As of March 15, 2016, Fannie had completed transactions transferring approximately $350 million in credit risk covering $11 billion in mortgage loans.These types of transactions are another useful tool for transferring risk. However, one disadvantage is that these are more likely to be used by larger originators, leaving the smaller originators at a disadvantage. Senior-subordinate structures with bottom tranches taking the credit risk and losses have been used in various asset classes for a long time including non-agency mortgage deals, commercial mortgage backed deals (CMBS), asset-backed securities (ABS), and Freddie’s K-deals backed by Multifamily loans. Freddie Mac has used this structure in two transactions so far, offering a total of $934.5 million in securities ($300 million FWLS 2015-SC01 in July 2015 and $634.5 million FWLS 2015-SC02 in Nov 2015). Both were backed by newly-originated fixed-rate super conforming prime residential mortgage loans purchased by Freddie Mac that, while eligible, were not delivered into TBA loan pools. In contrast to STACR deals, mortgage loans deposited in the trust are collateral for the bonds. Similar to K-deals, the securitization issues guaranteed senior and unguaranteed subordinate actual loss securities. Principal payments on the mortgage loans are generally allocated on a pro rata basis between the senior and subordinate certificates provided certain performance and collateral tests are met. Within the subordinate certificates, principal payments are allocated sequentially. Investors in non-guaranteed, subordinate certificates may not receive full payments of either principal or interest on the certificates as a result of realized losses on the mortgage loans in the FWLS trust. This structure has not been applicable for the agency backed mortgage securitizations. Agency CMOs do use tranching, but since the underlying pools are guaranteed by one of the GSEs, there is no need for credit tranching, as there will be no credit losses. However, Freddie can use this structure only for loans that it purchases (likely at the cash window which buys mortgages outright), which is a very small fraction of the overall credit risk of loans it guarantees. A December 2015 paper Delivering on the Promise of Risk-Sharing by Laurie Goodman, Jim Parrott and Mark Zandi summarized the various risk-sharing options being considered. The table below lists the various options in the Front-End and Back-End risk-transfer along with their pros and cons. In addition to the above Front-end and Back-end Risk Sharing approaches, another approach is possible which falls somewhere between the front-end and back-end solutions. The approach allows a STACR/CAS type deal as a cash deal rather than synthetic and allows K-deal type securitizations with a mix of guaranteed and unguaranteed bonds. The idea is to allow a holder of a fully guaranteed pool, after loans have been delivered and the pool is not a TBA anymore but before the pool has been securitized in an Agency CMO deal, to obtain a reduction in the total guarantee and loan level fees in exchange for assuming a certain amount of first loss risk. This option will be available to any holder of a mortgage pool, not just the originator of the loans. In this approach, there will be absolutely no change to the process of financing using TBAs. Mortgage originators will still use the TBA market to sell their production in a forward market with full guarantees from the GSEs as they do now. Mortgage originators will sell TBAs and deliver loans after origination as they do now. It is only after the mortgages have been delivered into the pool that the holder of the pool will have the option (but not an obligation) to take some of the risk of mortgage defaults away from the GSEs in exchange for reduction in GSE guarantee and loan-level fees. This will ensure that the TBA market will continue to function as it does now with no impact. Since the pool with the mortgages already delivered is likely to be held by a securitizer or an investor, this approach makes it possible for a wide set of market participants to take the default risk away from GSEs, unlike the Front-end risk sharing approaches which limit that to only the originator and may be of use only to larger originators, possibly putting smaller originators at a disadvantage. Also, having a larger group of market participants should bring more competition and demand from those with desire for the type of risk-reward profile offered by the new securities, which may not be available to them now. In terms of mechanics, this could be achieved by allowing anyone who owns an entire fully-guaranteed pool (let’s call it Pool A for this example) to give that Pool A to the GSE and in exchange receive two new sub-pools – a Senior portion and a Junior portion (let’s call them Pool A Sr and Pool A Jr) and an IO. Pool A Sr will carry the GSE guarantee while Pool A Jr will be unguaranteed. The IO will simply be a strip from the entire pool and represent the reduction in fees for the reduction of risk to the GSE. Similar to CRT deals, there will be a standardized waterfall governing allocation of payments between the Senior and Junior sub-pools. CRT deal waterfalls generally provide for scheduled principal payments to be paid to the senior first and then to the junior tranches. Principal amounts received from prepayments are split between the senior and junior based on a ratio. There may be a lockout period before any unscheduled principal payments are paid to the junior sub-pool. Also, the waterfall specifies some triggers, e.g. the Hard Enhancement and Cumulative Loss triggers. If the amount of default increases and a trigger threshold is reached, then some of the payments that may have gone to the junior otherwise will be paid to the senior instead. The structure could be somewhat similar to that used in the Freddie Mac’s FWLS deals. The new mechanism will open up several possibilities for securitizers and private investors. At present, banks purchase TBAs or pass-through pools which are fully guaranteed, and do Agency CMO deals creating bonds that carry the GSE guarantee. One option will be to place the non-guaranteed junior sub-pools with investors as high yield instruments and securitize the senior sub-pool in fully guaranteed Agency CMO transactions. Another option will be to securitize both senior and junior sub-pools in the same CMO deal that, like K deals, issues both guaranteed and non-guaranteed bonds. This will allow tranching of the senior and junior portions to create bonds with different risk-return profiles that will appeal to a broader set of investors widening the investor base. In 2007, the cash RMBS subordinate market was over $200 Billion. In the post-crisis era, there have been very few private-label RMBS deals resulting in little to no supply of subordinate RMBS bonds. The new structure will fulfill the need and bring in private capital to the housing finance system. Since these securitizations will be cash transactions with the underlying mortgages providing all of the cash flows, and not derivative transactions linked to a reference pool synthetically, the CMO bonds will be good real-estate assets for REITs and other investors. A wider pool of potential investors will allow better pricing and enable higher volumes to be sold. Since these will be cash deals, the actual risk of the pools will be transferred to private investors, and there will be no basis risk remaining with the GSEs. Also, unlike in CRTs, there will not be tail risk remaining with GSEs since there will be no need for the risk to come back to the GSEs after the maturity of the CRT transaction. This approach not only puts private capital, not taxpayers, in the first-loss position, but also does not favor larger originators or puts smaller originators at a disadvantage. The fact that the deals will be done by third parties, not the GSEs, just like Agency CMOs, reduces the role of GSEs compared to CRT deals, and encourages competition in private market by leveraging market participants who are currently doing agency CMOs. This proposed structure does not disrupt the TBA market. The additional functionality comes into play only after the loans have been delivered into pools. Also, unlike CRTs, the new structure does not require figuring out of the tax and accounting treatments for the new securities. The new structure is economically similar to CRTs, other than the fact that it is a cash transaction as opposed to a synthetic one. Since the economics to the GSEs and investors are similar, we know the new structure will work in terms of economics, if GSEs sell the same amount of risk at similar pricing levels as in CRTs. As with CRT deals, the new deals will start with a simpler structure, and evolve over time. The structure will allow more flexibility in managing how much of the exposure is transferred by managing the amount of reduction in fees for reduction in risk. Over time, greater amounts of risk could be transferred by slowly adjusting the total fees and reduction in fees. The new structure has several advantages over CRTs. However, it is suggested as one more tool in GSE’s toolbox, and not as a replacement for CRTs. The proposal above describes the basic idea and a framework for implementing it. There are several variations possible on the basic idea. Details will need to be worked out to leverage the existing systems and processes as much as possible and minimize the requirements for systems and other changes. However, by bringing greater amounts of private capital into the mortgage market, the new deal structure will reduce taxpayers’ exposure to mortgage credit risk, and will help the broader efforts to shrink the government’s footprint in housing. The K deal program was started in 2009 when the private label CMBS market was not functional. Just like K deals, the new structures will be hybrids between fully-guaranteed agency CMOs and non-guaranteed Private Label RMBS. A similar program for residential mortgages just might help restart the private label RMBS market. Note: The views expressed are solely and strictly my own and not of any current or past employers, colleagues, or affiliated organizations. My writings are simply expressions of my intellectual thought process. The intent is not to promote any particular view point or agenda, and the writings are not influenced by any other groups or individual. As of December 2015, there has been approximately $128 billion of issuance in 103 K-deals since the start of the program in 2009. The To-Be-Announced (TBA) market allows for the sale of securities before they have been finalized—as in, before the mortgages that back the securities have been identified. The full GSE guarantee makes that possible. FHFA’s 2015 Scorecard required $150 Bn and $120 Bn of risk transfer transactions from Fannie Mae and Freddie Mac respectively. The 2016 Scorecard requires transfer of credit risk on at least 90 percent of the balance of newly acquired single-family mortgages in targeted categories. Source: Urban Institute’s Monthly Chartbook for March 2016. Note: This article was originally published in Winter 2014 issue of CREFC World Magazine published by the Commercial Real Estate Finance Council. For simplicity, some models used by CMBS investors assume that the non-recourse borrower will default immediately if the DCR falls below 1.0 or LTV goes above 100 (percent). This is sometimes referred to as “ruthless default” behavior. In reality, however, borrowers do not choose to default just because DCR is below 1.0 or LTV is higher than 100. This article examines some historical data and attempts to look at various factors that have an impact on the borrower’s decision to default, and presents historical default rates for each category. Using different default rates for the different categories may be a better approach for scenario analysis for CMBS investors than trying to use fixed cutoff numbers for DCR and LTV to examine each loan to determine if it will default or not. An important underlying factor that motivates borrower behavior is the option value embedded in owning the real property. Also, borrower selection impacts ruthlessness. Market expertise helps borrowers measure the benefits of supporting an underperforming property based on potential future upside. Further, key to the decision to support the property is the borrower’s access to capital and overall liquidity – without which there is no ability to subsidize the property until the market improves. As part of their investment analysis, CMBS Investors run various scenarios of changes in economic conditions, cap rates, vacancies, NOIs, etc. The resulting DCR and LTV are used to decide if the loan will default in that scenario and what the loss severity will be in case of default. If DCR falls below 1.0, that clearly increases the likelihood of default during the loan term as borrowers are required to pay out-of-pocket to cover property expenses. When the property value is below the loan amount default is more likely and losses will be higher in case of default. Also, if the LTV is above 100 at maturity, the loan is not likely to not qualify for a new loan without putting more equity into the property, and hence there may be a maturity default. In practice borrowers do not choose to default just because DCR is below 1.0 or LTV is higher than 100. There is an option value to owning real property that impacts borrower behavior. The option value captures the possibility of upside in the future. Investors are aware of the option value. However, if 1.0 DCR and 100 LTV are not the cut off points, what are the levels that drive borrower behavior? Even more complex models must address this question as well. In this research we focus on the multifamily loans and look at the borrower default behavior in loans in both CMBS and Freddie Mac collateral. See full article at: Freddie Mac Research page, or CREFC World website. What’s Ahead for CMBS & Commercial Real Estate in 2013? Why did CMBS perform well in 2012 and what lies ahead. Note: These views were originally quoted on 19 Dec 2012 in article “Rally Drivers” in Structured Credit Investor. This article was also published on Seeking Alpha. In 2012, the CMBS market had a significant rally as is evident from the table below showing bond spreads over swaps. Not only were the spreads tighter significantly over the year, the performance was better than expectations by almost any measure. Issuance for the year was $48 Bn compared to forecast of $38 Bn. The new issue 10 year AAA spread to swaps ended at 90 compared to forecast of 140, and new issue BBB spreads ended at 410 compared to a forecast of 587 (all forecasts are averages of predictions by market participants as published in Commercial Mortgage Alert). The spread tightening was not limited to new issue either, legacy CMBS prices were up significantly too. Why did CMBS do better than expected, and can this trend of higher issuance and tighter spreads continue? There are two widely talked about reasons for spread tightening that generally apply to most of the spread products, and a third one that is specific to and very important for CMBS and commercial real estate. First driver of spread tightening is the purchase of large amount of mortgage securities by the Federal Reserve under its quantitative easing programs and investors search for yield in this low yield environment. Second significant factor is that the universe of spread product is shrinking as mortgage payoffs are greater than new issuance. $25-30 Bn of net negative supply per year in CMBS means that the money that was invested in CMBS is returned to investors and needs to be reinvested. More demand than supply leads to higher prices and tighter spreads. The third factor is a chain reaction that is more interesting and significant. As the above two reasons lead to tighter spreads for new issue CMBS bonds, the borrowing cost for commercial real estate owners decreases. Lower debt service payments from lower rates mean they can get higher loan amounts on their properties. That means a lot of existing loans that were not re-financeable or were border-line and expected to default can now be refinanced and do not need to default. As more loans are expected to payoff and expected defaults decrease, investors expect smaller losses in legacy CMBS deals. That means tranches that were expected to be written off may be money good or have lower losses. So investors are willing to pay more for them, and as people move down the stack to these bonds with improved prospects, the result is tighter spreads for these legacy bonds. Lower financing cost resulting from tighter bond spreads also helps increase liquidity and activity in commercial real estate market as it allows more investors to put money to work at returns that meet their requirements. More activity in the real estate market leads to more confidence among investors and increases real estate values, further reducing expected losses in loans leading to even tighter bond spreads. This chain creates a sort of virtuous circle – the exact opposite of the downward spiral we saw in previous years when the commercial real estate market deteriorated rapidly. As the virtuous cycle mentioned above continues, barring any shocks, spreads can continue tightening and lower financing cost from CMBS means that it can compete more with other sources of financing which means that CMBS volume can keep increasing. Indeed, the forecasts for CMBS issuance for 2013 generally range from $55 Bn to $75 Bn, up from $48 Bn in 2012. Spreads, however, have less scope for tightening than last year in my view. Looking at historical spreads in a somewhat similar environment (see What’s Ahead for CMBS Spreads? April 4, 2011), CMBS2 AAA spreads could be tighter by 20 bps and BBB- by another 140 bps this year. Generally rising confidence in underlying assets should result in a flatter credit curve, which implies more potential for gains in the middle part of new issue stack. Spreads will move around. Given the unprecedented low yield environment, the search for yield by investors could drive spread slower than expected. At the same time, events in or outside US could cause unexpected widening. The market obviously remains subject to any macro shocks. One concern cited by many investors is the potential loosening of credit standards by loan originators as competition heats up. That is a valid concern and if industry participants are not careful, history could repeat itself. However, though credit standards are becoming a little looser (LTVs were up to 75 in 2012 from 65-70 in 2011 and Debt Yields were down to 9-9.5% from 11% a year ago), we are nowhere close to where industry was in 2007. Still, investors should watch out for any occurrences of pro-forma underwriting if it starts to re-emerge. Looking further ahead, maturities will spike up again in 2015-2017, with around US$100bn of 10-year loans coming due. This could cause distress, but hopefully the commercial real estate market will have recovered enough by then to absorb the maturities. Still, it is something that we need to be mindful of for next few years. For me, one of the most important factors to watch out for is the continued supply of cheap financing for real estate owners. That has been one of the main factors that has brought us to this point from the depths of despair at the bottom and was the basis for programs like TALF & PPIP (see Solving the Bad Asset Pricing Problem) four years ago. In the current low-growth and low-cap rate environment, investors cannot count on increase in NOI or further decrease in cap rates to drive real estate values significantly higher. That makes availability of cheap financing critical and much more important than historically for achieving their required rates of return to make investments. Any disruption in availability of cheap financing can quickly reduce the capital flowing to real estate sector and may reverse the positive cycle that is driving spreads tighter and increasing real estate values. Anything that could reduce the availability of financing for commercial real estate owners will be the most important thing I will be looking out for this year other than the obvious factors. In commercial real estate, hotels and multi-family have improved the most. Hospitality sector, with no long leases, was the first to suffer and among the first to gain as economy started improving. Multifamily sector has done well benefiting from the financing by GSEs. Office and retail sectors have seen increasing activity but face a high unemployment and low-growth environment. If the economy keeps improving at the current slow rate, I think the industrial sector will offer more opportunities and see more activity this year. Note: The views expressed are solely my own and not of any current or past employers or affiliated organizations. Why New Issue CMBS deals see little interest in Mezz classes and what Issuers can do about it. A year ago around this time, the mood amongst CMBS market participants was quiet optimistic. Estimates of new issuance for 2011 from market participants generally ranged from $35 Bn to $70 Bn or more, on the way to $100 Bn in a few years. However, over the course of the year, the optimism has faded. New issuance totaled just $30 Bn in 2011, and forecasts are not much higher for 2012. With more conservative underwriting, higher subordination levels from rating agencies, and wider spreads, new issue CMBS was expected to be attractive to investors. Yet, investors seem to have pulled back, and spreads have widened for both legacy and new issue deals. Macro level issues, especially uncertainty about Europe, are part of the reason. However, CMBS spreads have been far more volatile than other sectors including corporate and other ABS. 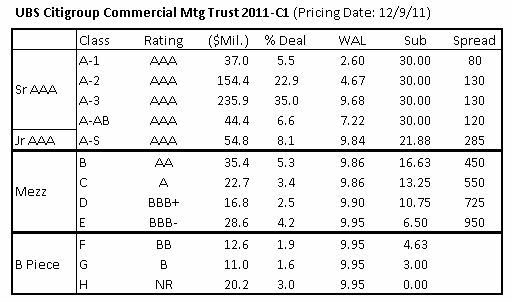 As the table below shows, even new issue AAA CMBS spreads widened a lot more than other sectors. This spread volatility not only deters investors, but also loan originators from making new loans as they do not have a good hedge to protect them while aggregating loans for securitization. It also requires wider spreads for CMBS loans which makes them less attractive to borrowers. One of the main reasons CMSB spreads widen quickly is that the sector has far fewer investors than other ABS sectors and corporate bonds. The reason there are fewer investors is that, with fewer loans, CMBS deals are lumpy and investors need the expertise to analyze collateral at the loan level. Not every investor has that expertise. So, they can feel comfortable analyzing RMBS, Credit card, Auto, Equipment, and Student Loan etc deals, but not CMBS. The creation of a super-senior AAA tranche helped bring more investors to AAAs by making the tranche safer needing less analysis. That is part of the reason AAA spreads have tightened. Spreads for classes below AAA, however, continue to be very wide, as the mezz tranches have even fewer investors. Unfortunately, Insurance companies, which are perhaps the most knowledgeable commercial real estate investors and ones with resources to analyze the CMBS deals at loan level, tend to buy mostly senior tranches. Mezz tranches are left to a very small set of buyers. That means lower liquidity for these tranches, and less certainty about receiving a decent bid if needed. An additional issue is lack of transparency on pricing, as these are small tranches that do not trade frequently and each one is different depending on deal collateral. These factors make these classes even less attractive to buyers. The table below shows the structure of a recently priced CMBS deal. The $674 mm deal has $118 mm of senior AAA, $55 mm of junior AAA, $104 mm of mezz tranches and $44 mm of B-Piece. What makes Mezz tranches more difficult for investors is that they have lower credit enhancement than AAAs and they are generally very thin tranches representing about 3% to 4% of the deal. In other words, a 3% higher collateral loss could result in 100% loss on the tranche. That means investors require even more conviction and expertise to invest in these classes. The thin tranches are also more susceptible to rating downgrades if any collateral in the deal faces problems. This fear of ratings volatility is another big concern for investors. One idea, that addresses both the spread volatility and the potential ratings volatility, is to do the opposite of what we did for the AAA – combine all the Mezz tranches into one single class. In this deal, instead of creating classes B, C, D, and E, there could be just one Mezz class. It will be a $104 mm class with average rating of around A-. At a thickness of 15% of the deal, this class will not be at risk of 100% loss if collateral loss increased by mere 3%, and so will be much less susceptible to spread and rating volatility. Also, with just one larger class, there will be more owners of that class and there is likely to be more trading and visibility on spreads, enhancing transparency and liquidity. If the combined Mezz tranche is priced around 640 over swaps or tighter, the issuer will have the same or better economics as with the tranched mezz structure. This will still be a significant pickup in spread for the same rating compared to other sectors and will probably bring in some new investors who were considering CMBS but were hesitant. At about 15%, the Mezz tranche is thicker, but still a small part of the deal. So, even a small number of new investors will make a difference. And the issuers can try this structure without taking any risk at all. That is possible by using a structural feature that has been used in residential deals (which are also REMICs): Exchangeable Classes. The deal can be setup so that some investors can buy the tranched classes while others buy a single Mezz class. The structure allows owners of one form to exchange for the other form at any point in future using the proportions defined in the documents. This has been used for a long time. I used exchangeable classes extensively in $52 Bn of new CMOs when I was trading and structuring CMOs. Freddie, Fannie, and Ginnie deals regularly have them under the names MACR, RCR, and MX respectively. There is no single magic bullet, but small changes can sometimes make a big difference. Some, like this one, are easy to try with a little extra work, no downside, and possibility of enlarging the pool of CMBS investors with all the benefits that come from it for investors, issuers, and people employed in the sector. Note: This article was originally published in Real Estate Finance and Intelligence. Update 6/15/12: UBS & Barclays introduced an exchangeable class combining part of mezz stack in their $1.2 Bn UBSBB 2012-C2 conduit CMBS deal. The 10 year tranche priced at S+160. The exchangeable class combining AS, B, and C tranches reportedly priced at S+280. Update 7/9/12: Morgan Stanley & Bank of America introduced a thick tranche combining parts of mezz stack in their $1.35 Bn MSBAM 2012-C5 conduit CMBS deal. Update 7/30/12: Morgan Stanley used exchangeable classes in $340 mm MSC 2012-STAR CMBS deal. Update 8/3/12: Deutsche Bank & Cantor Commercial introduced a thick tranche called PEZ combining the AM (junior AAA), B (AA), C (A), and D (BBB+) classes which is exchangeable into individual components in the $1.32 Bn COMM 2012-CCRE2 deal. Newly launched TRX.II may seem complicated, but is not difficult to understand. Markit launched TRX.II or TRX 2 indices this week. Details and various documents can be found on their website, but for those not familiar with the working of the index, or if the details on upfront payment and dynamic nature of the index are not clear, this article might help understand the mechanics and the underlying logic. The concept is simple. Going long or buying the TRX.II (or TRX) index is similar to buying a bond. If you buy a bond, you get the coupon. Also, if the spread goes lower or tightens, resulting in lower yield, the bond price increases. Same is true with going long the TRX index. If you go long the index, you get a coupon, and if spread tightens, the value of your position goes up. And just like a cash bond, if spreads widen, the value of the position goes down. The concept is similar, but there are some differences in implementation as the TRX is a contract (Total Return Swap contract) rather than a physical bond. For one party to go long, there has to be another party to take the short side. All that is needed for a TRX trade are the two parties wanting to take the opposite positions, and neither has to actually own or find the underlying bonds to initiate or close a position. TRX contracts will trade with quarterly expirations with a maximum length of one year. Since the contracts will be standardized, the trade may be initiated with one party taking the other side, and may be closed before expiry, if desired by either party, by doing an opposite trade with a third party. This ability to short easily is what makes it possible for loan originators to hedge their loans being aggregated for securitization. Once they enter into a contract, at the end of every month, the short party pays the coupon equivalent to the long party. Also, if the spread is tighter at the end of month than at the beginning, then the short side pays the price appreciation calculated based on average duration and spread change to the long side, and vice versa. These payments take place at the end of every month, or till the end of contract. Each month, the spread at the beginning of the month becomes the new starting point for spread change for that month. Also this spread is the coupon that the long party gets for that month. It is paid by the short party and represents the cost of hedging. The main purpose of the upfront payment in TRX is to handle trades initiated in the middle of the month. For example, if someone goes long on 11th day of month, they should get the coupon only for the remaining 20 days in the month, even though the short will pay full 30 days interest or coupon at the end of the month. So, just like in cash bond, the buyer pays an accrued interest for 10 days to the short. Net result will be the short will pay and the long will get net 20 days of the coupon for that month. Similarly, upfront payment adjusts for spread movement and traded spread. An example may help. Let’s assume the spread at the beginning of the month was 200, at the time of the trade was 230, and at the end of month was 220. In this case, spread tightened from 230 at the trade date to 220 at the end of month. So, the long party should get payment for the value of 10 basis points tightening at the end of the month. However, the standard payment mechanics will see widening from 200 at the beginning of the month to 220 at the end of the month, and will require the long party to pay the value of 20 bps. The upfront payment provides the adjustment that enables the normal end of month payments to take place in the usual manner. In this case, the upfront payment will be the value of 30 basis points (30 bps widening from 200 at the beginning of the month to 230 trade spread) paid by the short to the long. The net effect will be the long getting the value of 10 bps tightening, as he should. One big difference between TRX and TRX.II is that TRX.II is a dynamic index and has a revolving underlying portfolio whereas the original TRX or TRX.I was a static index. The TRX.II will be rebalanced every quarter to include recent deals meeting the inclusion criteria. The initial TRX.II index has 18 bonds. The index rules specify a maximum of 25 bonds. Once the index reaches 25 bonds, the older bonds will be removed as new bonds are added. The dynamic nature introduces some complexity, but key points to keep in mind are that all TRX.II trades for a specific maturity are fungible with one another and each payment calculation references spreads and average duration for the same set of index constituents. What that means is that when the index changes, the end of month spread for payment at the end of that month is based on the old index, and the starting index for next month is based on the new version of index with new bonds. To enable this, Markit provides numbers for both the old and new version of the index. Rest of the mechanism stays the same. The spreads used for monthly settlements are calculated and provided by Markit based on spreads provided by the ten participating dealers for the underlying cash bonds. The fact that the TRX.II will settle every month to actual cash bond spreads means that it will be expected not to stray too far from cash bond spreads. The resulting high correlation with spreads on recently issued cash bonds makes the TRX.II a good hedge for loan originators. The dealers provide spreads on the individual constituent bonds, not the spread for overall indices, which are computed by Markit. This ensures consistency between spreads for the old and new versions of the index, when the index is adjusted to include new deals. For the more technically oriented, Markit’s calculation methodology involves using individual bond cashflows to calculate prices from the average bond spreads for each bond and then using aggregated index cashflows and average price to generate index spread, weighted average life, and duration. The end of month calculation of price change from spread change uses the averages of beginning and ending durations and index prices, which captures the majority of the convexity effect. I have asked for creation of a new TRX index for a long time (Restarting CMBS Lending, Feb 9, 2010). So I am happy to see it getting launched. I also like that Markit created a dynamic index which will always reflect spreads on new issue bonds, though that makes it more attractive to hedgers than to investors who may prefer to go long a known set of bonds. TRX.II is a much better hedge than CMBX as it settles every month based on cash spreads and so is correlated with cash bond spreads, unlike CMBX which pays only when there are actual defaults (far into the future) and can trade purely based on technical factors with no correlation to new issue cash bond spreads. TRX.II is also a better hedge than TRX.I which references the old legacy CMBS deals and does not correlate well with new issue CMBS spreads. One question on the minds of many people is if the index will gain traction. The general view is that the demand from originators will be there to short to hedge loans being aggregated for sale via securitization, but there may not be enough demand from the long side. It may turn out to be the other way. With spreads wide at present and few deals in the pipeline, the index may see more demand from long side than short side. Hedging of loans for spread movement today is not an almost mechanical process it used to be (CMBS Hedging Requires a New approach, July 5, 2011) and different originators favor different strategies. However, no matter what method is used, hedging has a cost. When spreads are wide and expected to tighten, many originators prefer to hedge just the interest rates and not the loan spreads. Barclays created a CMBS 2.0 index earlier in the year, but it has not been used much, partly for that reason. The TRX.II may benefit from the fact that some originators are now being pushed by their risk management groups to be fully hedged, and TRX.II will have higher correlation with actual cash bond spreads than any alternative. Also, TRX.II has ten licensed dealers. So, there may be more liquidity and more openness by their internal origination groups to use it for their hedging. CMBS loan hedging issues have often tripped even smart real-estate lenders. The current environment requires a careful and different approach than in the past. Recent spread widening and volatility in CMBS market have drawn attention to hedging issues for loan originators in securitization shops. An article in this week’s Commercial Mortgage Alert (New Markit Index May Solve Hedging Woes) reported comments from market participants that the recent spread widening, which was equivalent to about 3% decline in value of loans held, hit all lenders, though to different extent depending on their hedging approach. In an increasingly competitive market with declining profit margins in loans, a 3% hit is clearly very significant for any origination business. Last week, a Bloomberg news story reported that spread volatility was as an important factor in Starwood Property Trust’s decision to back away from originating debt that would be sold entirely into securitizations. Hedging issues, even when people believed they were hedged, have tripped many very smart real estate lenders in the past. During the previous crisis, after the Russian debt problems in late 90s, the hedges made a huge difference. At the time, many CMBS lenders hedged using only treasuries. Only some used swaps. Those who used only treasuries were hurt doubly as treasury yields declined increasing the prices of treasury hedges they were short, while swap spreads jumped higher decreasing the value of their assets which were valued at a spread over swaps. Those who had hedged using swaps did not suffer that much. Those who did not use swaps had devastating losses. After that painful experience, everyone in the market moved to hedging with swaps. Hedging with swaps still left the risk of adverse movements in CMBS bond spreads, a smaller risk most of the time. Few years later, as competition increased and profit margins declined, some started using total return swaps on the Lehman CMBS indices (now Barclays Indices) to hedge that risk too. Those legacy indices are not useful now as they contain old deals. Some people have turned to CMBX1 for hedging, as it is closest to the new issue bonds amongst the five CMBX indices. CDS on IG Corp indices have been used at times by some, and I have heard people exploring use of other tools like equity indices. However, all of these approaches need to keep in mind that any hedge used needs to have a very good short-term correlation with new-issue CMBS bond spreads – longer-term relationships do not mean anything. If the hedge can move in the opposite direction of the asset in the short-term, it’s not really a hedge. Lack of a good hedge was one of the reasons that delayed restarting of CMBS lending. Last year, I suggested to Markit to create a new TRX 2 index based on the few new deals that had been done so far (Restarting CMBS Lending, Feb 9, 2010). The idea did not get much traction then. Julia Tcherkassova, who heads CMBS research at Barclays, articulated the need for a CMBS loan hedging mechanism internally, resulting in Barclays creating a US CMBS 2.0 Index earlier this year. That index provided a mechanism to hedge loans but it was not used much. An instrument existed to allow hedging of loans but no significant attempt was made to use or develop liquidity in it by the industry. The reason is probably as simple as the fact that new issue spreads were generally in a continuous tightening mode till the recent sudden widening episode, and that made spread hedging seem not that important. Another factor is that the hedging is expensive. In the past, the cost of hedging with Lehman index was around 30 bps (on an annualized basis). With CMBS2 indices, that cost would have been about 110 bps. Given that the loan volumes are lower, giving up profitability becomes tougher. So the new Barclays index came, but was not met with a strong demand and remained unused. The wider bid-ask spreads also make hedging expensive. Commercial Mortgage Alert reported that Markit is close to rolling out a new TRX index, dubbed TRX.2. Since it is coming out after a widening that was painful for many, it might attract more attention. Hopefully, it will provide a liquid instrument that can be used effectively for hedging loans being aggregated for securitization. However, another point to think about is that the new TRX index will likely come with or be followed by new CMBX indices. It remains to be seen if the new synthetic CMBX indices will introduce more volatility in cash markets as did the legacy CMBX indices. One thing is sure though – hedging is as important as anything else for loan originators and needs to be given proper attention. All the careful real estate analysis while making loans can come to nothing if sufficient attention is not paid to hedging while loans are being aggregated for securitization. Mechanically following the past methodologies will not be the best approach. The current environment calls for adjustments and creative ideas for hedging to be effective and less costly. What’s Ahead for CMBS Spreads? A revived CMBS market, with new deals getting done, is helpful to REITs and other commercial real estate owners as it has started making financing available again. Spreads had generally been narrowing which helped loan originators by reducing the hedging cost and has been good for owners of CMBS bonds. However, recent spread volatility has left some people concerned, and wondering about the future direction of spreads and how to look at spreads on the new CMBS 2.0 deals in the context of 2006-7 legacy deals. I always find it useful to start with views of market participants, and historical data for some perspective. Also, for legacy deals, estimates of losses are an important element. Below are forecasts for spreads for 2007 vintage CMBS for June 2011 published by industry’s weekly newsletter, Commercial Mortgage Alert at the beginning of the year, along with some other data. Comments and thoughts follow. Note: Loss estimates from market participants including sell-side research group, rating agencies, and advisory services. Periods for each CMBX series are approximate. To focus first on what had people worried most recently – widening of GG10 A4 bonds by 50 basis points from mid Feb to mid March, it is important to step back and look at the bigger picture. GG10 spreads are more visible because it is a benchmark deal and trades more frequently. As the table “Recent Spread History” shows, (i) spreads did widen out, but are generally back to where they were before widening, and (ii) even when they widened out, they were inside where they were at the beginning of the year. Another factor to look at is where spreads are compared to market’s expectations. The table above shows average prediction for 2007 vintage A4 bonds to be 184 over swaps. Mid March wide was swaps + 190 and the current spreads are swaps plus 165. Again, not as alarming when looked at in that context. Spreads for new CMBS 2.0 deals widened out too, but not by as much. 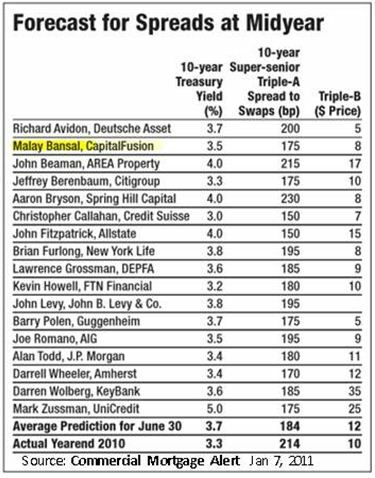 They went from 110 over swaps at the tight to 120 and are back to 110, compared to swaps plus 130 at the beginning of the year. Spreads did not widen much, but where could they go now? One perspective is looking at the history. The underwriting, leverage, and subordination in the new deals are comparable to what they generally used to be 2003 to 2005. However, looking at spreads over swaps at that time will not be as helpful because of the impact of recent events in swap markets. A better approach will be to look at spreads over the risk-free rate, or the spread over treasury notes. In the 2003 to 2005 period, CMBS AAA bonds averaged around T+75, whereas generic single-A industrial corporates averaged T+77. Currently, new CMBS spreads are swap plus 110 or T+117 and single-A industrials are T+97. This back of the envelope analysis would suggest that new CMBS AAA spreads could tighten by 20 basis points from the current levels. The demand for bonds is there and there is not a big supply in the pipeline. So the technicals favor continued tightening. Legacy CMBS deals are a bit more complicated given the losses expected by market participants (see table above). In general, expectations of losses seem to average around 11.5% for 2006-8 deals. One simple way of looking at the deals would be to assume subordination remaining after expected losses. On that basis adjusted subordination for legacy A4 bonds goes from 30 to 18.5, which is similar to the subordination for AAA bonds in new deals. Subordination for legacy AM bonds with loss taken out goes from 20 to 9.5. That is roughly between single-A and BBB bonds in new deals. This simplistic approach ignores several other factors that also come into play, but does the market see these as comparable? Market spreads for legacy AM bonds, at swap plus 280 seem wider than 190 and 270 for new deal single-A and BBB bonds. Similarly, legacy A4 spreads at S+170 are much wider than S+105 for new issue AAA bonds. However, if you look at yields, legacy A4 is around 4.65, close to the 4.60 on new issue AAA. Similarly 5.80 yield on legacy AM bonds is between 5.42 and 6.22 on new issue single-A and BBB bonds. Logical inference from above is that, in this yield-hungry world, the legacy bonds are generally in line with the new issue bonds in terms of yield, and legacy bonds should tighten along with new issue. The choice between them comes down to investors preference for stability, hedging, leverage, duration, etc. The above would suggest that a general widening in legacy but not in new issue bond spreads, unaccompanied by any deal specific news, as happened recently, may be an opportunity to pick up some cheap bonds if you can do detailed deal analysis and are confident in ability to pick better deals. What Do CMBS Spread Forecasts Say About Commercial Real Estate? Predictions about future bond spreads by market participants provide a window on their thinking about their expectations regarding the performance of the underlying asset class. CMBS industry’s weekly newsletter, Commercial Mortgage Alert published its semi-annual polling of predictions on CMBS spreads six months later last month. 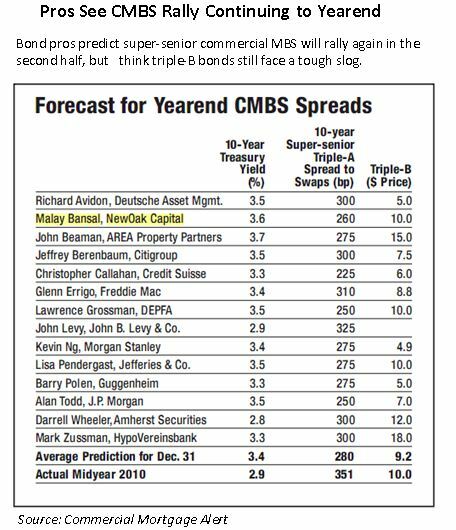 One interesting fact in the data was that not a single person asked for their prediction thought that the spreads will be wider six months later! Does this unanimity reflect wisdom of crowds and indicates a steadily improving commercial real estate market, or is this a contrarian signal with respect to where commercial real estate and CMBS spreads are headed? And how does that reconcile with forecasts of the real estate market conditions? 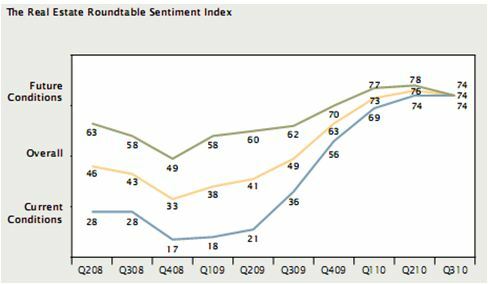 For the commercial real estate property market conditions, The Real Estate Roundtable has just published its 3rd Quarter 2010 Sentiment Index survey of more than 110 senior real estate executives. While the survey found significant concerns and uncertainty about economic & job recovery outlook, government policy, and capital markets, the overall sentiment is that the industry is in for a long slow recovery. The survey reports a Current Conditions Index (reflecting how markets are today vs 12 months ago), a Futures Conditions Index (expectations on how markets will be 12 months from now), and an Overall Sentiment Index, which is the average of the two. For the first time, the survey’s current and future conditions indices merged, scoring an Overall Sentiment Index of 74 (down from 76 in the previous quarter). This score suggests a relatively positive trend and a flat trajectory. The actual data on commercial real estate is sending conflicting signals and is being read by different people in different ways. Cushman & Wakefield report last month showing US CBD office vacancy dropping to 14.8 % in Q2 from 15% at end of Q1 -first drop since 2007, CMBS statistics showing declining pace of deterioration in delinquencies, etc are seen by many as signs that the CRE market is stabilizing. Others point to declining rents and high unemployment as factors that point to further declines ahead. Both the viewpoints have some validity, which probably implies that the CRE sector might move sideways in near term with some volatility caused by which of the two views is stronger at any given point, till additional market data clarifies the picture more. Going back to CMBS spreads, the tightening probably just reflects the sentiment expressed in other surveys of an expectation of slowly stabilizing CRE market. For CMBS, as opposed to properties, a consensus that the property price decline has stopped will be enough for bond spreads to tighten. Real estate prices do not necessarily need to go up for CMBS spreads to tighten. What happens if the sentiment on the economy sours impacting the view on the commercial real estate too? Even in that scenario, more and more people are coming to the view that the senior most CMBS bonds will likely not suffer a principal loss, which makes them attractive given the additional yield they provide compared to other similar investments. So, worsening economic conditions may actually cause people to move up in capital stack, creating demand for senior most bonds, and providing support for spreads. No one knows what future will bring, but logically, odds look in favor of the spreads moving in the direction suggested by the unanimous view. All of the above is fine for trying to understand these markets, but one practical conclusion, and the real point of this article is this: if senior CMBS securities can go up in value even when property markets go sideways, and will have some support if the property markets decline, then logically, senior CMBS bonds have to be better investments at present than commercial real estate properties or loans for those who can invest in any of those. Note: A version of this article was originally published on Seeking Alpha.The views in this article and my spread predictions in the Commercial Mortgage Alert article referenced are solely my own. Follow-Up: 12 Nov 2010: AAA Spreads have tightened from 350 mid-year to approximately 250. I was on a panel on Tranche Warfare last month in IMN’s 11th Annual US Real Estate Opportunity & Private Fund Investing Forum. It was a very well organized conference with a lot of people in attendance, and provided a great opportunity to exchange ideas with and listen to views of significant participants in the industry. The conference and views expressed have been reported earlier. Below are some of my thoughts on what I heard. The most common thread in a lot of comments, both in the panels and in private conversations, was the lack of opportunities to invest. Investors, remembering how much money was made purchasing cheap assets from RTC sales during the last real estate downturn of early 1990s, have raised a lot of money in anticipation of a similar opportunity this time around. However, those fire sales have not materialized, causing some disappointment. Many do not seem to realize that the investors were not the only ones who learnt from the early 90s experience. The owners of the assets, and the regulators, learnt too – if the assets are sold at cheap fire sale type of prices, investors make a killing, but the owners of assets lose out. So, this time around, the owners of the assets are trying to hold out as long as they can and it makes sense. Regulators, having learnt from the experience too, seem to be doing everything they prudently can, to give latitude to owners to avoid fire sales. Somehow, many seem to be disappointed at things not having played out the same way as they did in 90s! Seems logical that they should not, still many are surprised. The good news from many was that the opportunities, though not as plentiful, are there. And people are doing deals. They take a little more searching, a little more digging into the things that are out there to separate the good ones from the bad, and they are often a little smaller than ideally desired, but they are there. On the easy ones, there is competition, and sometimes those assets get overbid. So, discipline in the process is as important as ever. Another lesson that I came back with was that those GPs who gave themselves (or were able to get) more flexibility when raising funds in terms of types of investments, timeframe, and returns are better placed to take advantage of opportunities as they come up than those who got narrower mandates from their LP investors. The more I think about it, the more it seems to me that this time around, the process will be stretched out over a period of time. In commercial real estate, values are down – around 40% by some commonly used metrices, and there do not seem to be any immediate drivers that will quickly and significantly drive prices up. This is bound to result in transfer of assets from those owners who are overleveraged and do not have ability to put in more capital to refinance maturing loans in the new lower leverage environment. That will create opportunities for those with patient capital to invest. Just slowly. And they may not get fire sale prices, but they will be investing at today’s lower prices. These suggestions, sent to the Treasury & FRB in Oct 2008, proposed a plan similar to the TALF and PPIP programs, months before Treasury and others came around to the idea. They were mentioned in the NY Times Executive Suite column by Joe Nocera (complete document is available at nytimes.com here). The Treasury plan was first announced by Treasury Secretary Tim Geithner on Feb 10, 2009. The writeup also included the Turbo concept of limiting interest payments and using excess interest to pay down loan principal, which was included in the TALF announcement on Legacy CMBS on May 19, 2009. Several steps have been taken by the Treasury and Federal Reserve to address the current economic crisis. These are important and useful first steps, but as everyone knows, the problems are complex and will require additional action, including steps to tackle the root cause of the problem – declining house prices. Obviously, any step to stabilize house prices will need to focus on decreasing supply by preventing foreclosures as much as possible, and increasing demand by providing incentives to new home buyers. Making mortgage payments more affordable is key to both. Most efficient will be approaches that help people on the margin – people on the verge of defaulting on their mortgage, or those considering buying a house. 1. Better use of part of TARP Funds targeted to buy mortgage assets: Treasury can partner with private buyers instead of buying assets itself. Will increase efficiency by tapping private funds. There is a lot of capital waiting to be invested in distressed assets, but has not been invested yet as prices need to be lower to achieve targeted returns without leverage. Treasury will put up 50% and the private buyer will put up 50%, with Treasury’s interest being the senior interest. Funds will be used to buy distressed mortgages and securities at a discount from various large and small banks and financial institutions. Mortgage payments from purchased assets will be used in sequential order to (i) pay 5% interest to Treasury, (ii) 5% interest to the Private buyer, (iii) principal to Treasury, (iv) principal to the Private buyer, and finally (v) all residual to the private buyer as its return for the risk. This ensures that Treasury gets its money back first. The 5% interest for Treasury will apply for 5 years. After that, it will increase by 0.5% every year till it reaches 9%. Interest for private buyer will stay at 5%. Those taking the loan from treasury will need to agree to change mortgage terms to help homeowners including giving borrowers the option to (i) increase loan term by 5 to 10 years, and (ii) prepay loans at any time without penalty (any existing prepay penalties will be waived). Other terms to help homeowners may be included. Treasury will offer mortgage assets from banks for bids. The private buyer with the highest bid will get funds from Treasury. Banks will have option of accepting the highest bid or keeping the assets themselves. This type of plan will allow participation by numerous large and not-so-large investors. Since there will be multiple buyers competing to buy assets, with their own capital at risk, the plan would help in determination of fair market prices for distressed assets (instead of a situation in which TARP manager is the only buyer). This program can run in parallel with direct purchases of assets by treasury, or can be used to sell off assets purchased by Treasury at a future date. 2. Make mortgage principal payments tax-deductible for next 5 to 10 years. Mortgage interest is already tax-deductible. Making principal also deductible will make it easier for those who want to but are barely able to make their mortgage payments, and those who are considering buying a house. As an example, someone with a $350,000 mortgage and 28% marginal tax rate will save $6,250 over 5 years or $1,250/yr. Over 10 years, savings will be $14,900. Better than a single-shot stimulus payment, since (i) it will provide relief over a longer period of time, (ii) it attacks the root cause of the problem by targeting housing, and (iii) it will benefit local governments by preventing loss of property taxes that will otherwise result from foreclosure. The deduction may be limited to maximum 15 to 20% of total mortgage payment to focus the benefit more towards newer mortgages (after ten years, principal payment is likely to be more than 20% of total mortgage payment), &/or to mortgages issued in certain years to control total cost. The deduction can be phased out above a certain level of AGI to focus the benefit towards those who need it more. 3. Encourage mortgage modifications to lower monthly payments by extending the mortgage term by 5 to 10 years. Modify mortgages by increasing the term by 5 to 10 years to lower monthly payment. As an example, monthly payment on a 30 year mortgage with 6.5% rate will decrease by 4.4% (or $1,172/year on a $350,000 mortgage) if term is increased by 5 years. An increase of term by 10 years would reduce monthly payment by 7.4% (or $1,960/year on a $350,000 mortgage). Lowering payment without lowering interest rate may be more palatable from fairness perspective, and should be attractive to lenders if it avoids default. Removing any prepayment penalties should also be part of the modification as much as possible. On Feb 10, 2009, Treasury Secretary Tim Geithner, in a much anticipated speech, announced the long-awaited toxic asset plan, but the market was disappointed by lack of details and sold off. 1. Public-Private Investment Fund: One aspect of a full arsenal approach is the need to provide greater means for financial institutions to cleanse their balance sheets of what are often referred to as “legacy” assets. Many proposals designed to achieve this are complicated both by their sole reliance on public purchasing and the difficulties in pricing assets. Working together in partnership with the FDIC and the Federal Reserve, the Treasury Department will initiate a Public-Private Investment Fund that takes a new approach. Public-Private Capital: This new program will be designed with a public-private financing component, which could involve putting public or private capital side-by-side and using public financing to leverage private capital on an initial scale of up to $500 billion, with the potential to expand up to $1 trillion. Private Sector Pricing of Assets: Because the new program is designed to bring private sector equity contributions to make large-scale asset purchases, it not only minimizes public capital and maximizes private capital: it allows private sector buyers to determine the price for current troubled and previously illiquid assets. Note: This write-up was published on the Seeking Alpha here. It was a follow-up to the original suggestions, sent to Treasury & FRB in Oct 2008, which proposed a plan similar to the TALF and PPIP programs, months before Treasury and others came around to the idea. The Original TARP plan and the Aggregator Bad Bank ideas both have one major flaw: lack of a mechanism to determine appropriate prices for bad assets. Here is an approach to tackle this pricing issue. This approach also gets more bang for the buck for the Treasury by involving private capital in buying of these assets. More clarity in pricing and involvement of private investors are desperately needed for markets to return to normalcy. There are already a lot of private investors who have raised significant amounts of money to invest in distressed assets. However, a lot of this cash has not been invested yet. Part of the reason is that they desire lower prices to get their returns to higher target levels than what they can get at present. Sellers, on the other hand, are often not ready to sell at even lower than current prices, especially when they believe that prices are already too cheap based on fundamentals. This has led to a stand-off which is leaving these assets on bank balance-sheets. So long as these assets stay on their balance-sheets and uncertainty about their prices continues, banks facing mark-to-market losses can not focus on restarting lending in these markets again. Lower asset prices is one way private investors can get higher returns. The other method is if they can get financing for buying these distressed assets. If for example, they can get 50% financing on purchase price of assets, they can buy twice the amount of assets they could buy without the financing, thus roughly doubling their returns (minus the cost of financing). This will allow them to pay higher prices for assets and still earn their target returns. In the current environment, financing is generally not available to investors in these assets. Given that financing can increase returns significantly, it is especially valued by investors at present. And that is what provides the solution to the pricing problem, and can ensure that the banks get the highest prices possible for these assets today, without the risk of any future Mark-To-Market (or actual) losses. To attract private investors to buy distressed assets, the Treasury can offer to provide financing to private buyers. Prospect of higher returns, especially in an environment where returns on other assets are low, will attract lot of investors to the sector. However, financing will be provided to the buyer who has the highest bid on a given set of assets. That is important. The bidding process creates a mechanism for determining a fair market value for these assets. This plan will allow participation by numerous large and not-so-large investors, not just a few large investors selected by the Treasury. If the bid is too low and the bidder can make an exceptionally high return, another investor is likely to step in with a higher bid, if the bidding process is transparent and open to everyone. Different investors have expertise in different products. Those with the best expertise in the assets being offered will be able to value these assets and bid more aggressively. Since there will be multiple buyers competing to buy assets, with their own capital at risk, the plan would help in determination of fair market prices for distressed assets (instead of a situation in which TARP/Aggregator Bank manager is the only buyer). This bidding process also ensures the banks get the highest price possible for their assets in the current environment. If none of the bids are high enough, the bank is not required to sell, and can retain their assets. This ensures that banks are not forced by the program to sell assets at too low a price. If they choose to sell, their balance-sheet is cleared of these assets, and there is no future claw-back or liability related to these assets for them – the assets will be owned by a third party. They can go on to focus on other things. Any cash flow received from the assets will be used first to pay interest to the Treasury and the private investors. Then, it will be used to pay principal back to the Treasury. Private investors will not get any of their principal back till Treasury has been paid back completely. The interest paid to private investors will be small (perhaps 4 to 5% range on their invested funds, not the face amount of securities) and will be meant to cover their expenses. Majority of their return will come at the back-end, their higher risk reflecting their higher returns. This priority for paying back Treasury funds first will protect public funds by decreasing the probability and amount of any potential losses on these assets. Also, for home mortgage backed assets, Treasury can help homeowner mortgage-holders facing difficulty by requiring recipients of financing to agree to certain pre-specified steps to help homeowners in loan workouts. Providing financing, instead of buying assets itself, provides more bang for the buck for the Treasury. As an example, if the Treasury offered 50% financing on AAA assets, and it has $100 Bn allocated to the program, the program will clear $200 Bn of assets from bank balance sheets. If the treasury used the funds to buy the assets itself, it will be able to remove only $100 Bn of assets from the banks’ balance sheets. Also, it reduces the risk of loss on these assets for public funds, since Treasury will be paid first and private investors will be bear the loss before the Treasury takes any hit. Since private investors, who will have their own capital at risk before Treasury’s capital, will be buying and managing the assets, the Treasury will not need to build as big an infrastructure as it will need if it were to buy the assets itself. Nor will it need to pay management fees to third-party managers. Also, by using the private sector, this program can be ramped up much more quickly. To achieve the highest rational prices, the bidding process must allow wide participation by large & small investors (bids should be requested for portfolio sizes that do not discourage small to medium size investors), amount and cost of financing should be known in advance of bidding (will likely be different for different pools and can be announced for each portfolio when it is put up for bid – treasury can even ask for multiple bids for different amounts of financing), and private capital must be at risk while protecting public funds (otherwise plan may face opposition from public). I had originally included this suggestion among a few I had made to the Federal Reserve and Treasury officials in October after the original TARP plan was announced. I was happy to see the announcement of TALF, which will provide financing for new origination. However, financing for existing distressed assets will help clear the bank balance sheets of these assets, which is needed before banks are likely to increase originating new loans. Also, current Treasury plans do not include the Commercial Real Estate sector. It should be included before the issues in the sector escalate and become much bigger, as it will have significant impact on smaller regional banks that hold a lot of commercial real estate debt. No single step will solve all the problems. Neither will this one, and it should be one of many approaches. But this approach can be effective since it will start the process for establishing prices for distressed assets, involving private capital in solving the problem, and cleaning up bank balance sheets, which are all prerequisites for eventual return to normalcy in the credit markets.